"Jellicle Songs for Jellicle Cats" "Old Deuteronomy" "The Jellicle Ball" "Grizabella" "Macavity" "Mr. Mistoffelees" "Memory"
Before “Cats” had its 1981 West End premiere, it was viewed with immense skepticism: here was composer Andrew Lloyd Webber working solo, setting a series of children’s poems about kitty cats written decades earlier by the revered T. S. Eliot for a bookless show staged by an esteemed Shakespearean director, Trevor Nunn. Yet producer Cameron Mackintosh believed in the show, and its opulent effects and dancing felines enchanted what are euphemistically called “children of all ages.” Broadway producers sat up and took notice: here was a show that required no stars and had a West End cachet, a pre-sold market, and a known hit composer. Setting a pattern that would redefine Broadway in the 1980s, “Cats” was jet-propelled to New York, with $6.2 million advance sales. Despite begrudging reviews, few could ignore the spectacle provided by designer John Napier’s fantastical Brobdingnagian trash dump (wittily suggested to him by the title of Eliot’s “The Waste Land”) or the whirling cat dervishes of Gillian Lynne’s acrobatic choreography, all capped off by the Spielbergesque levitation of Grizabella to the Heavyside Layer via an enormous used tire. 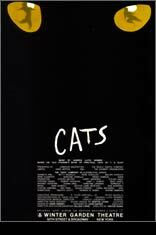 “Cats” mewed all the way to the bank; as of its final performance on September 10, 2000, it had grossed $380 million on Broadway (and nearly $3 billion worldwide). It even provided audiences with a hit show tune — “Memory” — which became a global hit, recorded in more than a dozen languages. The British import is the longest-running show in Broadway history — and it revolutionized the very concept of the musical form around the world.